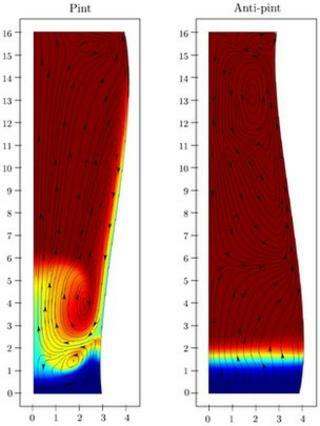 Simulations suggest an upward flow at the glass's centre and a downward flow at its edges in which the liquid carried the bubbles down with it. Now a study on the Arxiv server reports simulations and experiments showing the standard glass' shape is responsible. Like many such "fluid dynamics" problems, getting to the heart of the matter is no easy task; only recently was it proved they actually sink rather than being the result of an optical illusion. Now the University of Limerick's William Lee, Eugene Benilov and Cathal Cummins have discovered the simple answer to the problem - and a test that can be carried out by consumers as well. "One of the things we found was it's actually very easy to see bubbles forming in stout beer rather than in, say, champagne where the bubble formation process is much more violent," Dr Lee told BBC News. The team had the idea - borne out by calculations carried out by Mr Cummins - that the relative density of bubbles and the surrounding liquid could be behind the phenomenon. "If you imagine your pint is full of bubbles, then the bubbles will start to rise," Dr Lee said. "Because of the sloping wall of the pint, the bubbles are moving away from the wall, which means you're getting a much denser region next to the wall," Dr Lee explained. "That is going to sink under its own gravity, because it's less buoyant, and that sinking fluid will pull the bubbles down." The bubbles, that is, are "trying" to rise, but the circulation that creates drives fluid down at the wall of the glass. "You'll see sinking bubbles not because the bubbles themselves are sinking, but because the fluid is and it's pulling them down with it." Mr Cummins carried out calculations using a simulated pint and "anti-pint" - that is, the upside-down version of a pint glass - showing the effect at work; in the anti-pint, the bubbles rise as expected. If the glass is tilted at an angle while the pint settles, the side in the direction of the tilt represents the normal situation of a pint glass, while the opposite side is the "anti-pint" - and bubbles can be seen to both rise and fall in the same glass.